Lindsey and Kyle are a fun-loving couple with incredibly cool personal style! Lindsey is a hairstylist who specializes in retro vintage looks and Kyle is a tattoo artist and comedian. 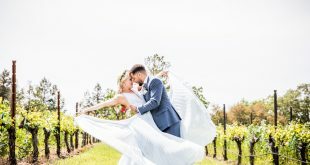 When these two decided to tie the knot they planned a unique and fun wedding that was truly “them”! 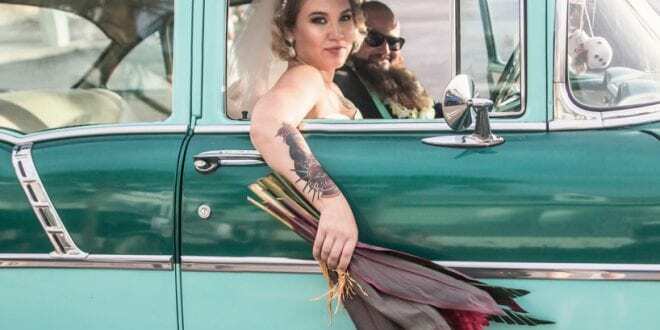 First, they exchanged vows on stage at Coconuts Comedy Club in St. Pete Beach, Florida, in a ceremony filled with love and plenty of laughs. Lindsey was gorgeous in her retro-inspired dress and long veil. She finished her look with sequined tennis shoes and carried a bouquet of tropical red ginger flowers. Kyle wore all black with aqua suspenders and aqua kicks for an upscale casual look that fit right into the day’s funky retro vibe. The happy couple exchanged floral leis as a unity ritual and posed for photos outside the club after their first kiss as a married couple. Then they headed out to their bar crawl reception, making their getaway in an awesome vintage car! Congratulations Lindsey and Kyle!